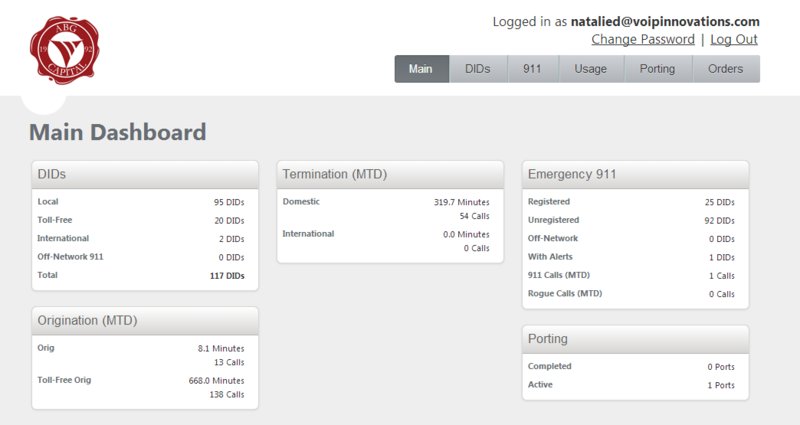 This is the End User Portal Main Dashboard that end users see when they first login. Let me give you a brief overview of who are before I get into the nitty gritty of the portal. We are a Wholesale VoIP Service Provider who aggregates the best quality and lowest price VoIP services to sell to resellers, who then sell to end users. We have developed an industry leading BackOffice platform, Titanium III, which gives the reseller a vast amount of transparency and automation. It is also stocked with countless features and functions that save time and, ultimately, money. The same principals behind the reseller BackOffice were applied to the End User Portal, and it has turned out to be something exceptional! Before this portal was created, the end user would need to make a call to the reseller if they wanted to purchase a new DID or add/remove a feature. With the End User Portal, that call is completely eliminated because the end user can login to the portal and do everything themselves. End user Key Performance Indicators (KPIs) such as DIDs, Termination, E911, Origination and Porting, are also included in the portal. When looking at the End User Portal from the reseller perspective, it is understandable that they might not want end users to have the ability to purchase DIDs or add/remove features. We saw this concern and created a solution that allows the reseller to pick which functions the end user is able to use. These settings range from giving full access to end users, only allowing them to view the KPIs, and everything in between. If the reseller chooses to grant full access, the end users are free to purchase DIDs and add/remove features. Please note that before anything is final, the reseller must approve or reject the end user requests. The reseller can either drop down the Clients menu in their BackOffice, select Pending Orders to see every open request, or they could open an individual Client and view the Pending Orders for that Client only. 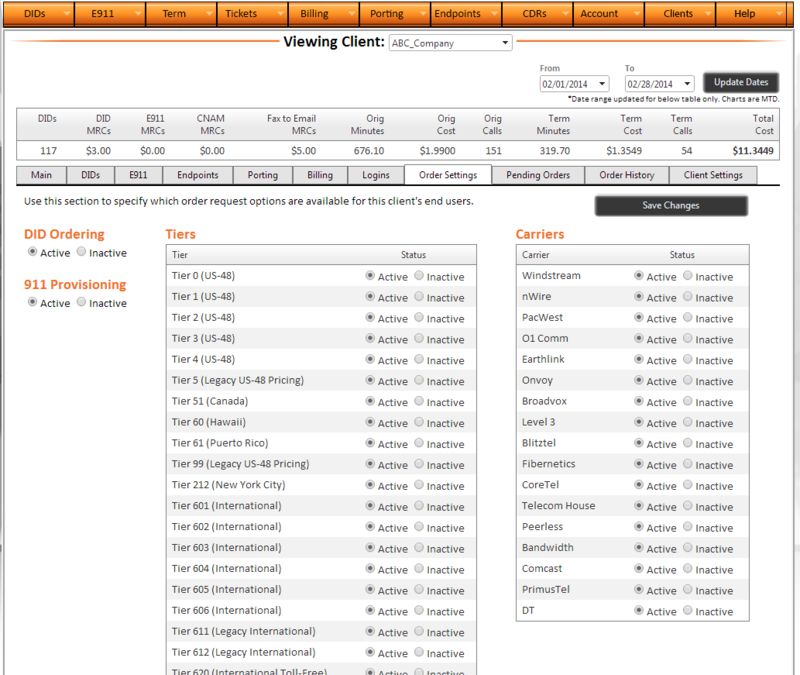 This is the updated Clients section in Titanium III. Resellers will be able to manage their End User Portals through this dashboard. Before the end user can log on to the portal, the reseller must create them a login. This can be done easily from their BackOffice account. Once the login is created, the end user will get an email verification with a temporary password and a link to the portal. There is one generic URL that gets sent out to the end user, but if a reseller wishes to use a branded portal login page, a unique URL is provided in the End User App Settings in the BackOffice. The App Settings is also where the reseller can add a display name, email (important for getting notifications) and phone number. This is also where they can upload the logo that will show up on the login screen and in the portal for end users to see. The End User Portal is ideal for smaller resellers who may not have the resources to deal with constant end user requests. The majority of our customers fall into this category and we believe they will benefit greatly from this new development. We will be adding detailed instructions to our Wiki that will benefit resellers, as well as end users. We’ll also be adding video tutorials to the VoIP Innovations University YouTube account that help the resellers and end users familiarize themselves with the capabilities of their new portals. Please click the orange button below to test our our End User Portal!